Dontnod's Remember Me let you rewind memories; Life is Strange lets you rewind time. That's bound to have interesting repercussions in an episodic adventure game, and to that end the developers have outlined how your time power works in the above video, the second in their dev diary series. Every time travel story worth its salt establishes its rules and then adheres to them slavishly, and by the sounds of it Life is Strange might be one of the good ones. Choices/actions in the story can be rewound using protagonist Max's special power, but any items she may have acquired in the process will be kept on her person. Meanwhile, Max remains motionless as she uses her mysterious powers, so you won't be able to run around in time travel mode. Booooo. There's also a neat double exposure visual effect active while you undo time, underlying the fact that Max is into photography. 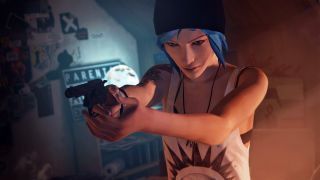 The first episode of Life is Strange is out January 30th; you can watch the first dev diary, and check out the system requirements here.